Victoria consulting is the first company in Serbia who started and continously actively promote EMAS in Serbia, since 2006. For almost a decade, Victoria consulting has been publising main EMAS activities at web page: www.victoriaconsulting.co.rs (EMAS services), on December 2014, Victoria consulting has initiated and created EMAS Portal web site: www.emas.rs, especially dedicated to EMAS. Victoria Consulting is a consulting company, established in May 2006 in Serbia (specialized in environmental issues, system management standards, sustainable development, chemical management and organizing trainings), which has a good networking with majority of relevant stakeholders in environmental field in Serbia. Consulting services which Victoria consulting provide are: Environmental Impact Assessment (preparation of Environmental Impact Assessment Studies, Cleaner production (and ECOprofit), EDD – Environmental and Health and Safety Due Diligence; waste management plans, etc; Chemical hazard risk assessment; consulting services for implementation of standards: ISO 9001:2008, ISO 14001:2004, BS OHSAS 18001/ISO 45001, ISO 50001:2011, EMAS (Eco Management and Audit Sche,e); IPPC, licensed school for chemical advisors; environmental legislation, CSR consulting services (including Sustainability Reporting/Non-financial reporting), Education and trainings in environmental issues, sustainable development, cleaner production, system management standards. Victoria Consulting has quality and environmental management system certified according to ISO 9001:2008 (from 2009) and ISO 14001:2004 (from 2012). Also, Victoria Consulting has proven results in social responsibility issues (since 2010-2014 listed in the first ten SMEs companies in CSR national contest), quality excellence (one of the 5 awarded SME’s in Quality Oscar 2012 contest). 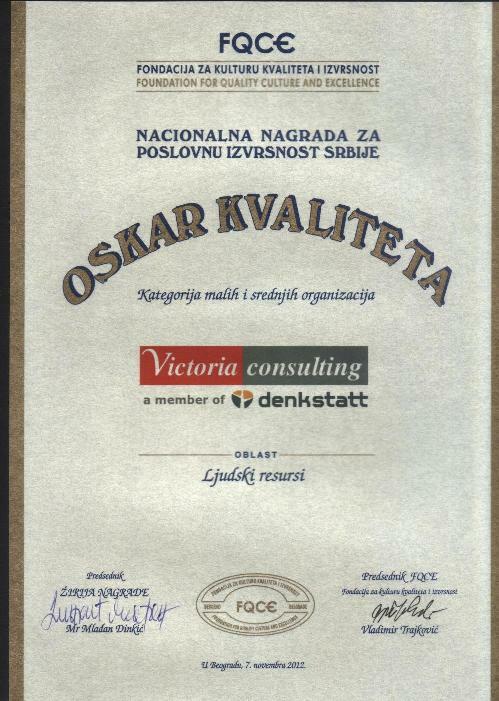 Victoria consulting is one of the first organizations from Serbia who has published Sustainibility report according GRI criteria (GRI 4). Victoria consulting clients are from the all industries. Majority of the clients are from the private sector. Some of the references: Japan Tobacco International Serbia, Robert Bosch Serbia, Heineken, ERSTE bank, Raiffeisen bank, Toyota, Renault Nissan, Carlsberg, Telekom Austria/VIP mobile, Ford, Canon, Tetrapak production, Palfinger, Knauf, Serbian chemical Agency, Serbian glass Factory, Farmakom, Delta Agrar, Galenika, Velefarm, Grand motors, Serbian municipalities (Vrbas, Kragujevac, Novi Sad, Obrenovac, etc), etc. Environmental protection, in financial profitable manner. Reduction of environmental impacts, compliance with legal and other demands concerning environmental protection and improvement of environmental performance of our clients’ and also our business, in a profitable, rational manner. Continual work on our indirect, positive environmental impacts through raising environmental and social responsibility awareness. System – but for real! Introduction, implementing and maintaining a management system in a way that will produce real benefit of our clients’ and also our business. To make the world a tiny bit better. Contribution to improvement of complying to general interests of community – by providing services which promote the principles of socially responsibility, environmental protection and sustainable development. The leading company for providing services in the area of environmental protection, sustainable development, management systems and chemical management in Serbia, that stands out for excellence of provided services and that is recommended by satisfied clients, and which is also recognized as reliable partner for the companies all around the World. 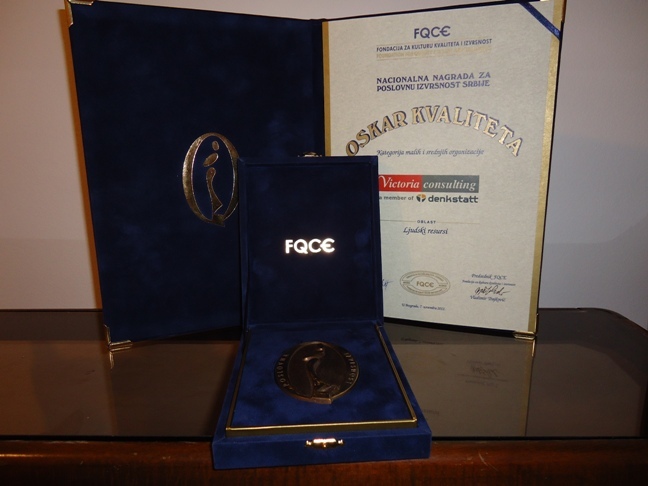 Victoria consulting is one of the 5 awarded SME companies – Quality Oscar, 2012, based on the EFQM Excelence model .